I certainly don’t clean my house or car as much as I should. The two things I do most often though are mop our floors with wood cleaner and wipe dog snot off my car windows with glass cleaner. I try to keep Chester and Gretel off of the floor when it is still wet but that is near impossible so the cleaner can get on their paws. I usually clean my car windows while Chester, Gretel and I are waiting for a ferry or getting gas so I worry that the window spray might get in their nose. Because the cleaners I use can affect Chester and Gretel, I try to pick the safest ones. There are so many out there claiming to be “natural” and “safe” though so it’s hard to choose. I was excited to learn that the U.S. Environmental Protection Agency (EPA) just announced a new “Safer Choice” label that will start showing up on shelves this spring. 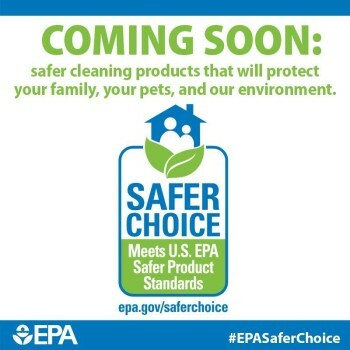 The Safer Choice label will let consumers know which leaning products are safer for themselves, their pets, their kids, and the environment. EPA scientists employ a stringent set of human health and environmental safety standards when reviewing products for the Safer Choice program, so a product with the label is backed by EPA science. Consumers know it’s a credible stamp they can trust. You can also learn more about Safer Choice label and certified products on the EPA website. Great info! I too try to pick safe cleaners. This will be really helpful in trying to identify good options. I dropped commercial cleaners a while ago. Vinegar, baking soda … These things can get most cleaning jobs done. Like Jana, I typically just using vinegar as well. Vinegar mixed with water. But for some things, you just need a commercial cleaner, like for cleaning windows without streaks. Glass cleaners even bother me (they give me allergies), so I can only imagine how the affect my pets who are much smaller.